I recently got the opportunity to discuss the work of British screenwriter and novelist, Alan Sillitoe with members of The Alan Sillitoe Committee, including Alan’s son David. The name might not be familiar to many film fans but Alan Sillitoe is responsible for writing SATURDAY NIGHT AND SUNDAY MORNING (Karel Reisz; 1961) and THE LONELINESS OF THE LONG DISTANCE RUNNER (Tony Richardson; 1962). He gave a voice to Britain’s “angry young men” and helped define a generation. Both SATURDAY NIGHT AND SUNDAY MORNING and THE LONELINESS OF THE LONG DISTANCE RUNNER are films that are near and dear to my heart and undoubtedly two of the best films to emerge from the British New Wave in the ’60s. I’ve briefly mentioned both movies on numerous occasions but I haven’t given them as much attention as I’d like. SATURDAY NIGHT AND SUNDAY MORNING will be airing on TCM this Saturday (Nov. 19th) so I thought it would be a good time to rectify my negligence. You can find my interview with members of The Alan Sillitoe Committee at the Movie Morlocks and I thought I’d share some of my thoughts about the film here. In SATURDAY NIGHT AND SUNDAY MORNING, Albert Finney made his incredible screen debut as a young man by the name of Arthur Seaton. Arthur is a working-class lad raised in Nottingham who lives with his parents. He has a dead-end factory job that pays the bills but it leaves little room for much else. He spends the work week looking forward to his Saturday nights and Sunday mornings. During these weekend breaks Arthur fishes with friends, drinks himself into a stupor and seduces any willing lady that catches his eye. When he clashes with his boss and is accused of being a ‘red’ (communist) or gets beaten up for sleeping with a married woman, Arthur doesn’t let it faze him and lives by the motto, “Don’t let the bastards get you down!” while making it known that “I’m out for a good time – all the rest is propaganda!” demonstrating that he is much too smart and much too curious to be satisfied with the life his parents have accepted. Unfortunately, Arthur’s rough existence has made him mean and he doesn’t suffer fools lightly. But underneath all that false bravado is an angry young man with a volcanic size chip on his shoulder that could explode at any moment. Despite the underlying tension that filters through every frame of SATURDAY NIGHT AND SUNDAY MORNING, the film seems to end on a somewhat upbeat note with Arthur denouncing his parents (“They have a TV set and a packet of fags, but they’re both dead from the neck up.”) and realizing that he’s his own man, able to make his own way in the world, even if that world seems determined to hold him back. Watching SATURDAY NIGHT AND SUNDAY MORNING again recently, I was reminded of how poignant and powerful the film’s underlying message still was. Few films address the concerns of young working-class people so directly and so well. As I said earlier, it’s one of the most important movies that emerged from the British New Wave and it features a literal ‘who’s-who’ of British cinema at the time including the fabulous Albert Finney as young Arthur. Finney swaggers through the film like a beautiful bulldog always keenly aware of everything going on around him. The film made Finney a star and it’s easy to see why. He’s a handsome man but it’s more than just good looks that make young Finney so irresistible. He’s deeply committed to the role of Arthur Seaton and he was able to harness the kind of rough and tumble working-class spirit that is so hard to find in today’s young actors. He’s a genuine tough guy and you don’t want to mess with him but he’s just soft enough to win a woman’s heart. SATURDAY NIGHT AND SUNDAY MORNING was directed by Karel Reiz who brought a real authenticity to the film. Reiz was part of the British Free Cinema movement and his documentary background gave him the ability to honestly capture the Nottingham local. He gave the film a real sense of place and purpose. The celebrated cinematographer Freddie Francis also helped shape the look of the film and there are some truly beautiful scenes that showcase Albert Finney and his costars (including award-winning actress Rachel Roberts and Shirley Anne Field) in the most flattering light imaginable. These lush moments can occasionally take you out of the film but Reiz and Francis quickly return you to the gritty streets of Nottingham. 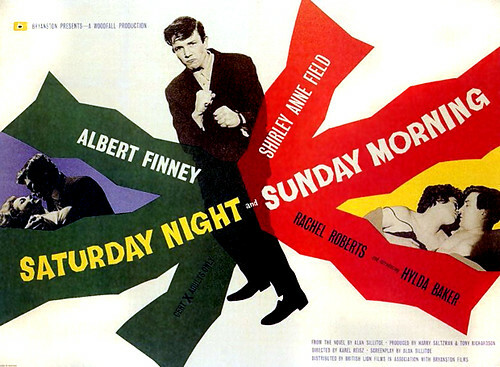 SATURDAY NIGHT AND SUNDAY MORNING was also edited by Seth Holt (THE NANNY) and produced by Tony Richardson (THE LONELINESS OF THE LONG DISTANCE RUNNER) along with Harry Saltzman (LOOK BACK IN ANGER). And last but not least, it features an amazing jazz riddled score by John Dankworth (THE SERVANT). If you’d like to learn more about this terrific film please follow the link to the Movie Morlocks. It will take you to my interview with members of The Alan Sillitoe Committe where we discuss Sillitoe’s work in film. I also wanted to give a special shout-out to fellow film blogger and Alan Sillitoe Committee member Neil Fulwood who agreed to answer questions and went out of his way to contact Alan’s son David. Cheers, Neil! Please stop by his terrific film blog, The Agitation of the Mind and tell him I sent ya.